About fifteen years ago, as an undergraduate student in Spain, I convinced a few friends of mine to apply for a Summer School at CERN, the European Organization for Nuclear Research. With over 15,000 scientists and engineers from all over the world working in unison to reveal the secrets of nature, CERN is probably the most extraordinary research institution in the world. Getting there was our dream. The only thing that we needed was the consent and signature of a physics professor at the University of Granada in charge of student exchange programs. I sadly remember how the heads of my friends were going slowly down and down as such a “gentleman” was telling us, as a matter of fact, that “only the crème de la crème, students from MIT, Princeton, Oxford or Cambridge get to go to these kind of workshops. This is a small university and our students are not prepared for that.” He did not sign the forms. I went to England to do a PhD in experimental nuclear physics. But that was not the end of the story. 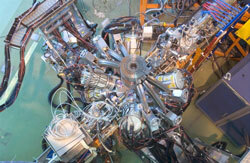 CERN has recently been the focus of breaking news worldwide with the discovery of the Higgs boson. Not only is the Higgs boson the particle credited with giving others mass (and helping us to understand how we come into being) but it might also be responsible for the existence of the mysterious dark energy, which keeps speeding our universe ever faster. CERN’s breakthroughs are built upon the shoulders of a technological giant, the Large Hadron Collider (LHC), the highest-energy particle collider ever constructed. It goes around the entire city of Geneva in Switzerland and is one of the great engineering milestones of humankind. Other exciting high-energy physics programs at CERN concern the production of quark-gluon plasma that existed shortly after the Big Bang, finding clues for dark matter and the potentially missing antimatter. The MINIBALL gamma-ray spectrometer at the ISOLDE facility at CERN as seen from above, where UWC will carry out their measurements. Not only do CERN’s scientists use the high-energy protons from the LHC and its booster accelerators to investigate the Big Bang, the Higgs boson and other high-energy physics; they also study the physics that addresses the origin of the low-energy interactions between nuclei – the strong nuclear force. The physics of interacting nuclei accounts for how the elements were (and are) created through nuclear reactions in explosive stellar scenarios – the physics of exotic materials that may lead to advanced technologies – the physics of creating a sustainable and safe energy supply by taming our sun, for example. This is the physics that has consumed, and still is consuming, more human hours than any other scientific question in the history of humankind. This is the physics that the Nuclear Physics and Nuclear Astrophysics Group at the University of the Western Cape is pursuing. The South Africa-CERN (SA-CERN) collaboration was originally founded in 2008 by visionary researchers from the Universities of Cape Town, Johannesburg, Witwatersrand, KwaZulu–Natal and iThemba LABS. 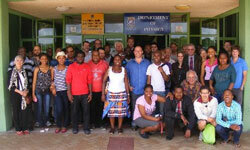 The University of the Western Cape joined in the year 2012. Most of the South African physicists are involved in exciting discoveries in high-energy physics and collaborate head-to-head with their international counterparts. Professor Krish Bharuth-Ram from the University of KwaZulu-Natal is the South African pioneer doing low-energy material science research at ISOLDE, the Radioactive Ion Beam Facility at CERN. Bharuth-Ram has developed a world-class research program studying semiconductor-compatible magnetic materials for innovative spintronic applications – an emerging nanoscale technology based on the detection and manipulation of the electron spin. He does so by implanting radioactive beams for a few hours onto metallic oxides and studying their de-exciting properties. The SA-CERN collaboration, supported by Baruth-Ram, funded Orce’s first trip to CERN in 2012. On the 29th of October 2012, Prof Orce entered the main gates at CERN to defend the first research proposal in low-energy nuclear physics ever led by a South African institution. At CERN, a scientific committee of internationally recognized physicists, the INTC, would decide upon the fate of the different research proposals from all over the world. Only institutions involved in submitting “Letters of Intent” can, in principle, submit and defend research proposals. During the same meeting, another research proposal co-led by Dr Mathis Wiedeking at iThemba LABS was defended by researchers at the University of Oslo. This experiment was approved and beam time recommended by the INTC. “The physics case was found interesting and relevant”, but a letter of clarification with a full simulation of the experiment was required before giving UWC the beam time. Entry to the dream laboratory was never going to be easy. Incidentally, the acceptance of the Oslo-iThemba LABS proposal was a major, and largely unnoticed, breakthrough for South African science and, up to date, these are the only two research proposals in low-energy nuclear physics ever submitted to CERN which include South African institutions. In simple words, our experimental proposal goes into looking at the shape of nuclei with extremely tiny dimensions of a few 10-15metres where no electron microscope can reach. In particular, our experimental proposal is about measuring the shape of a very exotic isotope of selenium produced in the explosions of binary star systems composed of a neutron star and a normal giant – these so-called X-ray bursts are the most common explosive phenomena in our Heavens. How this nucleus may change its shape with relatively low excitation energies, from a cigar to a rugby-ball shape or vice-versa, is not understood. It affects the decay properties of nuclei and, hence, the abundance of the elements as we see them around us today. Understanding of how the elements were (and are still) created in stellar explosions is what UWC is aiming at. Orce submitted the Letter of Clarification on June 30th 2013. The INTC has just given the final verdict. “The results of these simulations and the explanations provided were found to be satisfactory. The experiment is considered sensitive enough and capable of determining the relevant observables.” In a nut-shell, the first proposal in nuclear physics ever led by a South African institution has been approved. Students from the UWC MANuS program (mainly) together with students from other South African institutions and local and international speakers during the 2012 Tastes of Nuclear Physics held at UWC. It cannot be forgotten, however, that the physics remains to be done. UWC has been preparing for this particular goal since the beginnings of the MANuS/MATSci Honour’s/Master’s program in 2008, where the Honour’s students in the MANuS (Masters in Accelerator and Nuclear Science) program are instructed in the physics of nuclear structure and reactions as well as in nuclear experimental techniques needed to succeed at carrying out experiments such as the ones UWC proposes at CERN. Similar CERN-like experiments have been proposed and approved by UWC to yet another scientific committee at iThemba LABS (Somerset West) and the first one of this kind was successfully run by scientists at UWC and iThemba LABS in November 2013. The first SARChI Research Chair in Nuclear Science in South Africa, Professor Smarajit Triambak, took up a position in September 2013 to strengthen the group. Two UWC students, Nontobeko Khumalo and Nicholas Erasmus, have already been at CERN for a workshop on statistical data analysis involving nuclear physics experiments in March 2013. Key players over time include Professors Robbie Lindsay, Reginaldt Madjoe, John Scharpey-Schafer and Ramashwar Bharuth-Ram. Other South African and international institutions and our MANUS/MAtSci partners at the University of Zululand have also supported this enterprise. We shall definitely be prepared when the time comes. The UWC experiment will run sometime in 2015 or early 2016, due to unforeseen emergency activities at the LHC during the long shutdown. About fifteen years after my initial dream of getting to CERN, we have provided South African students with the keys to unlock the mysteries of the Heavens. 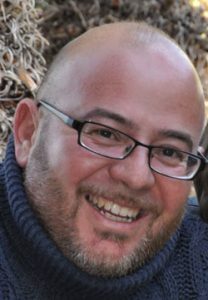 Prof Nico Orce obtained his bachelor’s degree in Fundamental Physics at the University of Granada in Spain. He completed a PhD in Experimental Nuclear Physics at the University of Brighton in England in 2003. After eight years of basic research on Nuclear Physics at the University of Kentucky and the Canadian National Laboratory for Nuclear and Particle Physics (TRIUMF), he joined the UWC Physics Department in 2011. Nico Orce is the discoverer and co-discoverer of new types of nuclear excitations. His research includes the study of clustering structures in nuclei to elucidate the origin of life, the abundance of elements in the Universe, existence of collective nuclear excitations and development of new nuclear models. His research is based at different laboratories around the world, including iThemba LABS, University of Kentucky, TRIUMF and CERN. “Dreams are only achievable through loving what you do – through many hours of dedication, painstaking efforts, enjoyment and satisfaction.” says Orce.